We Can Easily Run Java App Engine Applications on OpenShift PaaS For Fully Free of Cost. All You Need is an OpenShift Account to Move. We have talked about Architecture of Google App Engine before, Guide to Cloud Computing explains and links towards all the needed knowledge resource. As OpenShift is not only provides a free forever usage tier like Heroku Cloud, plus it is based on free/Open Source softwares, cost lesser, it is possibly a good plan to move your App Engine Applications towards free resource. It is quite painful to work with Google App Engine – our quite famous Google Plus RSS Feed died as we coded for a closed source software. One should understand the difference between a Free Software and Software which bundled with a SDK. However, even that much work is not needed because OpenShift has a ready made solution. 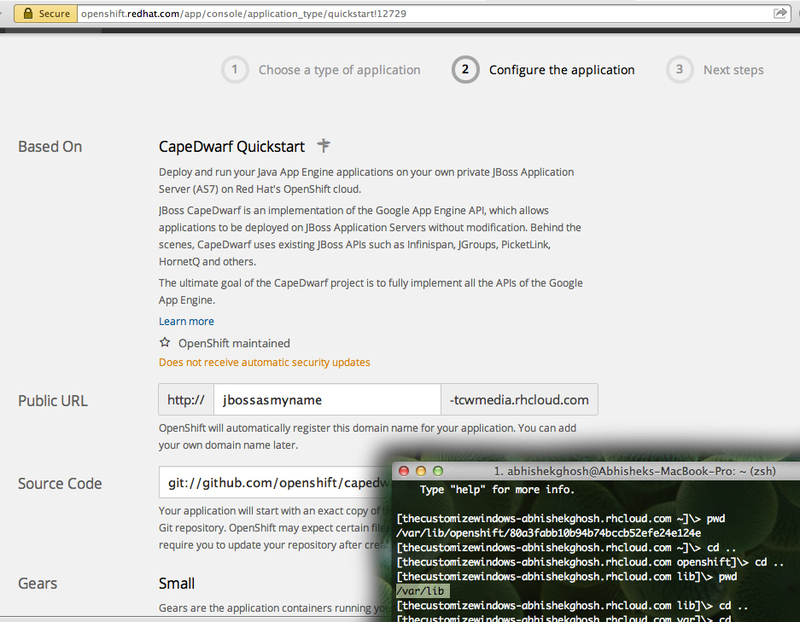 CapeDwarf is available as an application, ready to deploy. Search with the keyword CapeDwarf in the search box and click to get started. It will take a bit time to get ready. After it gets ready, you can easily access your this instance and push your app from command line. You can read our guides on OpenShift SSH, Installing Command Line Tool for Red Hat OpenShift PaaS on OSX, Get Started With Command Line Tool for Red Hat OpenShift PaaS, Shell Access on OpenShift etcetera guides if you have lesser experience with PaaS. Cite this article as: Abhishek Ghosh, "How To Run Java App Engine Applications on OpenShift PaaS," in The Customize Windows, May 27, 2014, April 26, 2019, https://thecustomizewindows.com/2014/05/run-java-app-engine-applications-openshift-paas/.